Alex Merced: Invest in technology & charity to reduce number of abortions. Darryl Glenn: Life begins at conception. Donald Trump: Unpredictable abortion funding good; Planned Parenthood bad. Hillary Clinton: Troubled by misleading allegations about Planned Parenthood. Joe Miller: Roe v. Wade is judicial activism at its worst. Misty Snow: Don't interfere with private medical decisions of women. Wendy Long: Attempt to save life of child if you must do abortion. Darryl Glenn: Supports fetal personhood; opposes Planned Parenthood. Evan Bayh: Supports public funding for Planned Parenthood. Katie McGinty: Supports public funding for Planned Parenthood. Michael Bennet: Classify contraception as preventive care & no moral issue. Pat Toomey: Great news that employer can withhold contraceptive coverage. Scott Milne: Pro-life; and no free birth control. Gary Johnson: Veto any legislation that will result in deficit spending. Bob Niemeyer: Cut the size of government and jobs will follow. Jill Stein: Don't use 'religious freedom' as fig leaf for discrimination. Marco Rubio: Men's bathrooms are for men & women's bathrooms for women. Evan McMullin: I believe in traditional marriage; but not everyone does. Mike Weinholtz: 100% score from Equality Utah for pro-LGBT policy stances. Scott Milne: Opposes affirmative action. Kate Brown: Grow Our Own: develop existing Oregon businesses. Kevin Stine: Tax loopholes allow companies to pay meager tax rates. Evan McMullin: Opposes death penalty. Scott Milne: Supports the death penalty. Marco Rubio: Prove medical benefits to FDA before legalizing marijuana. Patrick Murphy: Let states decide marijuana legalization. Evan McMullin: Opposes legalization of marijuana. Bruce Lisman: No legalization now; let's see what happens in other states. Matt Dunne: Legalize marijuana quickly; prohibition hasn't worked. Phil Scott: No legalization at this time; but I'm not saying never. Scott Milne: Pass tougher drug laws instead of decriminalizing. Sue Minter: Supports legalizing marijuana. Darryl Glenn: Feds should leave marijuana law to states, including banking. Darryl Glenn: Congress should leave opioid law to states. Jon Keyser: Feds should let marijuana businesses use normal banking. Jon Keyser: Focus on awareness and treatment for opioid addiction. Donald Trump: I may cut Department of Education. Donald Trump: Call them vouchers or scholarships; I call it competition. Hillary Clinton: Common Core is most important non-family enterprise in US. Hillary Clinton: Voted against vouchers; but public school choice ok.
Hillary Clinton: Unconstitutional to post Ten Commandments in schools. Jill Stein: No charter schools; yes public; no Common Core; yes local. Jill Stein: Guarantee tuition-free education pre-school thru university. Bob Niemeyer: Charter schools are the answer; throw out Common Core. Bud Pierce: Apply Massachusetts Education Reform act to Oregon schools. Kate Brown: Seamless public education from cradle to career. Donald Trump: Fracking will lead to American energy independence. Hillary Clinton: Natural gas is a "bridge fuel". Sue Minter: Keep electric rates low to compete in New England. Darryl Glenn: I do not believe that man is contributing to climate change. Evan Bayh: Climate science is unequivocal, but don't hurt business. Jill Stein: Halt any investment in fossil fuel infrastructure. Evan McMullin: Expand offshore oil drilling. Kevin Stine: End corporate handouts to fossil fuel companies. Mark Callahan: Do nothing about global warming; it's a fraudulent invention. Ron Wyden: Boost renewable energy and the low-carbon economy. Bud Pierce: Enhance infrastructure & natural resource based jobs. Bud Pierce: Partially support hospice/respite centers. Chris Sununu: More home-care funding ultimately lowers the cost of care. Colin Van Ostern: Include respite care for family caregivers. John Carney: Respite care programs for family caregivers. Donald Trump: Treating Israel like a second-class citizen will end. Jill Stein: Support Iranian nuclear deal as part of nuclear-free Mideast. Katie McGinty: Supports Iran nuclear deal. Evan McMullin: The U.S. should remain in the United Nations. Foster Campbell: U.S. should remain in the United Nations. Scott Milne: US out of the UN, and UN out of the US. Donald Trump: It's scary that people can vote without ID. Hillary Clinton: Automatic voter registration and 20-day early voting. Jill Stein: Make voter ID laws obsolete and impossible. Darryl Glenn: Supports unlimited contributions by individuals. Gary Johnson: Citizens United decision protects First Amendment. Katie McGinty: Constitutional amendment to overturn Citizens United. Michael Bennet: Federal review voting of discriminatory state voting changes. Pat Toomey: Voter ID law protects integrity of the system. Bud Pierce: Mandate government to release requested info for free. Kate Brown: Disclose lobbyist info & pay, on public website. Pat Toomey: Expand background checks and apply terrorist watch lists. Patrick Murphy: Expand background checks; bar people on watch lists. Evan McMullin: Opposes further restrictions on gun purchases. Kate Brown: Access to healthcare improving, but there is more we must do. Colin Bonini: Expand on the CARE Act and educate caregivers. Darryl Glenn: ObamaCare has made health insurance much more expensive. Evan McMullin: Supports PATRIOT Act, but with limited scope. Jon Keyser: Keep United States Northern Command in Colorado. Katie McGinty: Support DREAM Act plus earned path to citizenship. Evan McMullin: Anchor babies ok, but no benefits & no amnesty. Foster Campbell: Grant citizenship to children of illegal immigrants. Scott Milne: No immigrant benefits; no DREAMers; no amnesty. Darryl Glenn: Repeal the federal minimum wage. Evan McMullin: Opposes raising federal minimum wage. Foster Campbell: Raise the federal minimum wage. John Neely Kennedy: Belief in Jesus informs every decision I make. Alex Merced: I consider myself spiritual, via faith and forgiveness. Darryl Glenn: God is the highest authority in my life. Donald Trump: Fiercely defend religious freedom and terms like "Christmas". Donald Trump: I go to communion and that's asking forgiveness. Hillary Clinton: They say "religious freedom" but mean "gay discrimination". Joe Miller: I am a limited government constitutionalist. Joe Miller: We created greatest Republic by looking to God for wisdom. Misty Snow: Spiritually, I value love and compassion for all people. Misty Snow: I describe myself as a libertarian-leaning progressive. Wendy Long: Human nature's propensity for sin necessitates Constitution. Wendy Long: Conservative work for Judicial Confirmation Network. Kevin Stine: The Senate is full of multi-millionaires over the age of 60. Ron Wyden: Give voice to those who often feel left out of the debate. Bud Pierce: Require automatic enrollment with payroll deductions. Chris Sununu: Flexible retirement savings, and ensure Soc. Sec. solvency. Colin Van Ostern: Focus on good jobs so people can save for retirement. Kate Brown: More options & opportunities to save for retirement. Colin Bonini: Tax incentives to encourage payroll deduction savings. Evan Bayh: Raise Social Security age. John Carney: Expect to work longer than our parents did before retiring. Michael Bennet: Eliminate income cap for payroll taxes. Todd Young: Strong support for privatization. Darryl Glenn: Raise retirement age for those aged under 55 now. Jon Keyser: For next generation, use free market reforms. Mark Callahan: Support flat tax or FairTax; oppose growing government. Ron Wyden: Sophisticated wealthy few distort tax system. Bud Pierce: Public transit ok, but future is autonomous drive vehicles. Kate Brown: Expand public transit to ease traffic congestion. Phil Scott: Reform alternative utility regulation; no executive bonuses. Sue Minter: Utility rate goal: transparent process & affordable rates. Gary Johnson: Boots on ground, bombs, & drones make things worse. Katie McGinty: No ground troops against ISIS. Patrick Murphy: Air strikes against ISIS but no ground troops. Jon Keyser: Iranian regime is evil, and cannot be trusted. 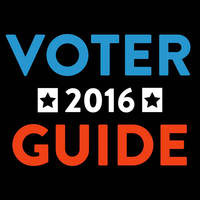 The above quotations are from 2016 Voter Guides for Senate and Gubernatorial races.